Lipase B from Candida antarctica (CALB) was successfully immobilized onto the surface of porous silica gel particles that had been modified using (3-aminopropyl) triethoxysilane (3-APS or γ-APS) and then crosslinked using glutaraldehyde. The surface modification of the porous silica gel was conducted both in an aqueous medium using Tris buffer solution at pH 10.6 and in an organic medium using toluene, respectively. Subsequently, CALB was immobilized onto the silica gel particles in an aqueous medium using Tris buffer solution at room temperature and at a pH of 7.5. 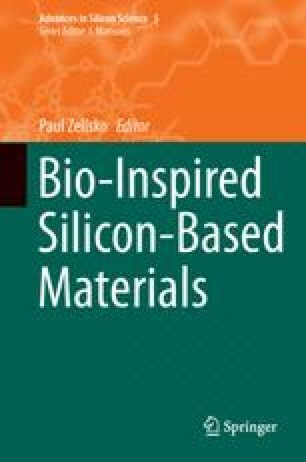 In another approach, CALB was entrapped in porous silica using a biologically inspired green method. The catalytic activity and the thermal stability of the immobilized enzyme systems including a commercial product were assessed by a model esterification reaction between 1-octanol and lauric acid carried out in isooctane at 37 °C. The results demonstrate that the immobilized CALB on silica had both a high catalytic activity and also good thermal stability when compared to free CALB. We thank the National Science Foundation (NSF) for Center Funding to two of us (Clarson and Gross) under the TIE Grant NSF #0631412. SVP thanks the Royal Society for funding (Grant # TG090299).